In preparation for the onset of autumn (the leaves are a’changing and there’s a crisp in the air), I bring you a mix and match of light sweaters perfect for the in-between weather of seasonal changes. 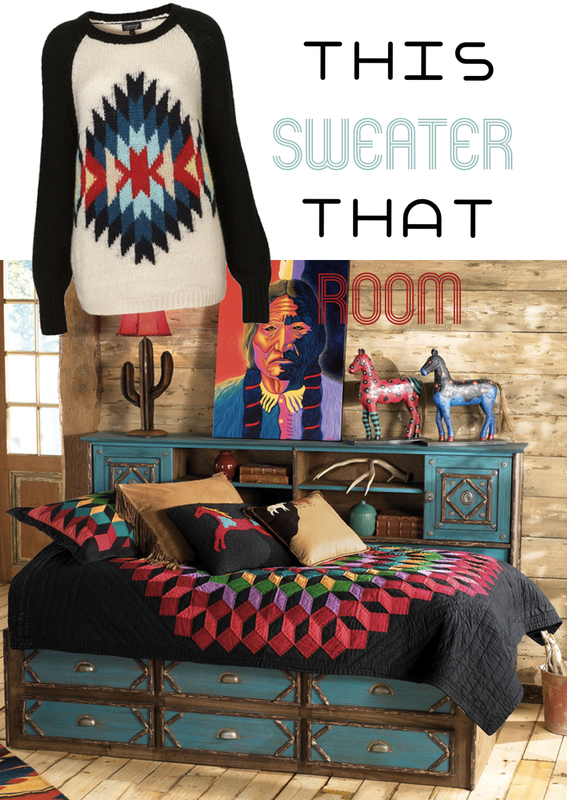 Sweater: A bold, Southwestern motif lends an on-trend accent to a slouchy collegiate sweater by Topshop found here. / Room: Retreat to a Southwest hideaway, at home. Live in a handcrafted cove of pine with distressed, hand-painted turquoise finish. The details give it the necessary character and situate your in your own personal desert oasis: twigs, conchos, cacti, a stampede of horses, antlers and painted flowers. Las Cruces bedroom found here. Sweater: Knitted from the softest angora-blend and adorned with two intarsia tigers, Mulberry’s light-brown sweater is a sartorial conversation starter. The relaxed fit and flattering neutral hue make it a weekend fail-safe, found here. 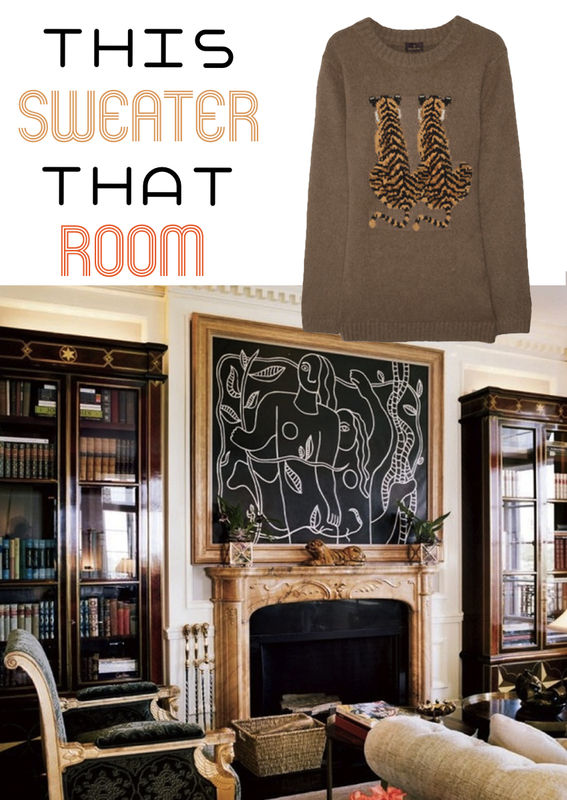 / Room: Designer Valentino’s drawing room plays on rich browns, and deep contrasts between dark and light, where a Léger Peinture Murale (1932) and a Ming-dynasty tiger sit regally atop a mantle. Can you find the mammal? Photographs by Jonathan Becker via Vanity Fair August 2010. Sweater: Like the Salvador Dali couch, or Marilyn Monroe’s famous red pair, these lips were sealed with a kiss! To purchase, click here. 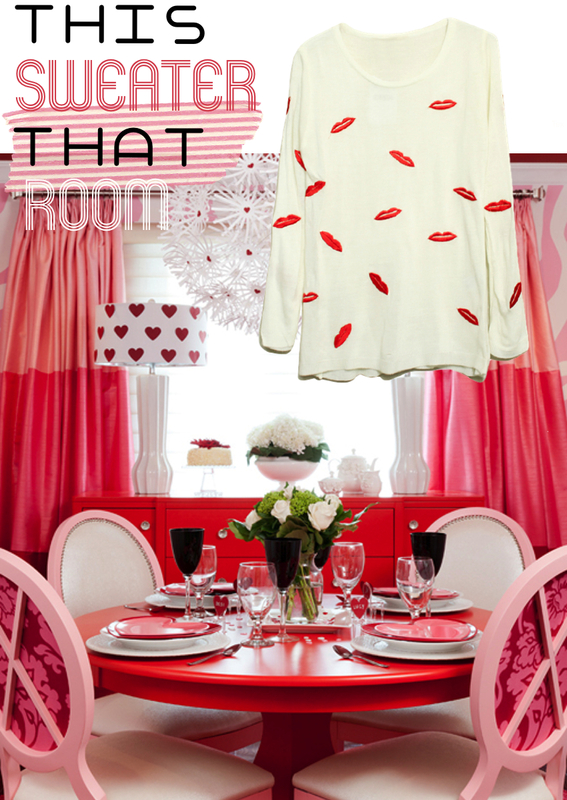 / Room: Live inside of St. Valentine’s house daily with this ultra themed dining room. Heart plates, red lacquer, color blocked drapes, and the whimsy of someone’s Barbie dollhouse! Photography by Donna Griffith and esign by Jennifer Brouwer Interior Design, via Coco + Kelly!